Rodriguez has also been honored for his work as a journalist with the Dorothea Lang-Paul Taylor Prize in Journalism, and his writing has appeared in the New York Times, Chicago Tribune, Los Angeles Times, The Nation, U.S. News & World Report, The Guardian (UK), Grand Street, American Poetry Review, Fox News Latino, Huffington Post, and elsewhere. He is also a script consultant for the FX series, Snowfall (does the series name need to be italicized?). 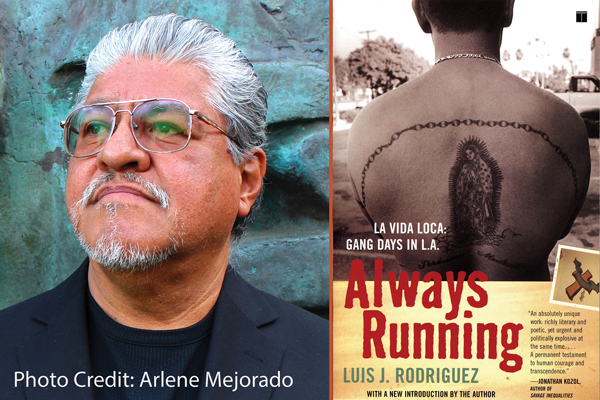 Rodriguez helped found a number of organizations—such as Chicago’s Guild Complex, Rock a Mole Productions, Youth Struggling for Survival, Tia Chucha Press, and Tia Chucha’s Café and Centro Cultural—a bookstore, coffee shop, art gallery, performance space, and workshop center in the San Fernando Valley in Los Angeles. He is (also) on the steering committees of the Poor People(‘)s Campaign and the US Justice Party. Luis J. Rodriguez’s visit is made possible through the generous support of the Chelsea Community Foundation and the Friends of CDL.